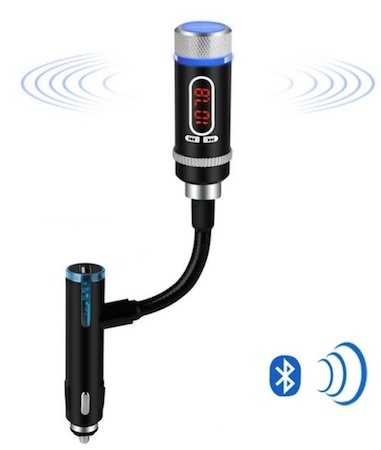 The Steambot Y Wireless In-Car Bluetooth FM Transmitter from Mpow allows users with older cars to enjoy Bluetooth functions. With the Steambot installed users can make hands-free calls, listen to music or GPS voice navigation and charge iPads or iPhones. The MSRP for the Steambot Y is US$74.99, but I found it on Amazon for $36.99. A easy to follow user manual is included, and there is an 18 month limited warranty. It is simplicity itself to install this product. The microphone attaches to the base with both a plug-in contact point and a strong magnet so it stays put. The adjustable neck design is strong and stays in place once positioned. Once in place, you just pair your phone (open your iPhone to the Bluetooth function, search for MPOW on the options list, and wait for the blue indicator light to come on.) Then tune the car's FM radio frequency to an unused FM station, tune the Steambot's FM transmitter to the same frequency by twisting the ring, and you are ready to go. The user must manually search for an open station to use. This can be pretty tedious in areas where the airwaves are crowded although It did not prove to be a problem in the Austin, TX metro area (population about 885,000). There is no automatic-tuning option on the transmitter. Turn it on or off by holding down the multi-function button on top of the transmitter for three seconds. Turning that same button controls the volume. I found that I got the best results if I put both my car radio and the transmitter at the highest volume. Calls may be accepted while the transmitter is already in use. Just press the multi-function button. To end a call press it again. Double pressing rejects a call. I really like this feature because I can take a call without taking my eyes off the road. The base also provides a USB port for charging your iOS device. One issue that should be important to users is the sustainable quality of the sound for either transmission from your radio or taking phone calls. To test this I made several trips around town to see if the quality was maintained wherever I went. I was pleasantly surprised at the consistency of the sound. I do. Particularly at the $36.99 Amazon price. It allows drivers of older cars to enjoy bluetooth capabilities, it is sturdy, and easy to use. It is equally easy to remove it from sight when desired. Well crafted and sturdy. Allows drivers to access Bluetooth features even when Bluetooth is not built into the vehicle. Provides sustainable quality of the sound even when driving around to different areas. USB port for charging. Drivers of small cars should check the distance between the cigarette lighter plug and the tip of their dashboard to assure the device will fit properly. Depends on a local, unused FM frequency.